I thought the rain in May was bad, but it seems the rain in July has been even worse. I'm working from home at the moment is most of the staff based around Tewkesbury, Gloucester and Cheltenham. Several friends are without power and fresh drinking water and looking at the helicopter aerial view on the news the other night the flood waters have taken out most of the Gloucestershire area. Thankfully workers managed to save a local substation and the weather has changed, so hopefully once the waters have started to subside the power problems will be restored quickly. However, that isn't likely to be until the end of the week. 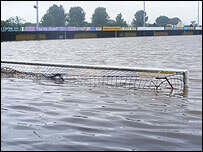 The water problems might take several weeks, as treatment centres have been affected and the amount of flood water has been extremely high in places (yes that's the goals at a local football pitch). You can see 5 galleries of pictures on the BBC Gloucestershire site. I'm not sure what kind of devastation has hit Gloucester Business Park, but MessageLabs have asked none essential staff to work from home. This has mostly only affected the development and administration staff, as with our business being a global operation, our data centres are distributed all around the world. I'm lucky as we live on part of the incline from the Lickey Hills, and Birmingham hasn't been hit anywhere near as bad, but I know of at least one person whose home is out of action. I just hope everyone else is okay.